Retiring after 20 wonderful years of service to our brides, family, and friends. 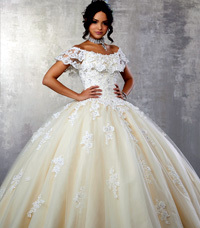 All Bridal, Mothers, Bridesmaid, Prom, Special Occassion, and Quinceanera gowns and dresses on sale now!!! Up to 70% OFF our entire stock! 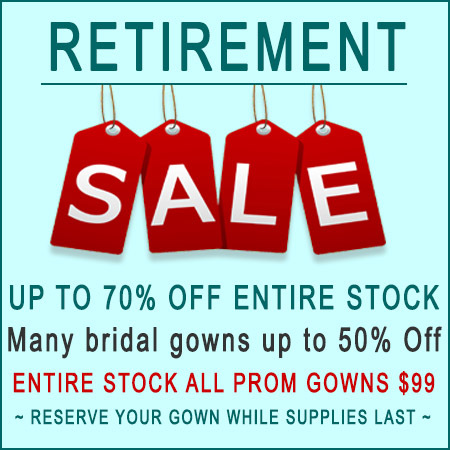 Many Bridal Gowns and Dresses 50% OFF! Accessories, jewelry, veils, and shoes on sale! Entire Stock of Prom Gowns Just $99 Each! Pizazz is a full service bridal salon! You will get one-on-one personal attention when you come to Pizazz. Call to schedule your free bridal consultation or for assistance with your online order! We encourage you to schedule an appointment so we can provide a more personal experience. OUR EXPERIENCED BRIDAL CONSULTANTS ARE EAGER TO ASSIST YOU.